I researched and wrote this themed walking guide soon after completing my masters in archaeology and it can be used as an archaeology tutorial as well as a guide to the countryside. The 21 walks (plus options of shortcuts and detours) take the reader/walker around different areas of the Peak District, getting as close as footpaths and landowners allow to a variety of archaeological sites. Features range from Neolithic tombs to Iron Age hillforts. The book includes an archaeological introduction and glossary of terminology. Explanations and theories such as how crop marks are formed and what we can deduce about a culture from its burial practices, are included at appropriate points along the way. 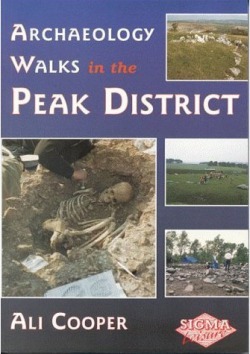 The book was originally available in paperback from retailers throughout the Peak District, and high street stores in surrounding towns. The imprint has since been bought by another publisher, and has a new cover, and updates to content regarding new visitor centres. It can now be purchased from online retailers. I'm not sure where else the new publisher has made it available.